For years, it seemed as if Frederick Gardiner had had the last laugh. Though attempts to move Fort York to make way for the Gardiner Expressway failed during the 1950s, the historical site’s location, hemmed in by traffic jams in the middle of an industrial neighbourhood, did it few favours. But thanks to recent developments, the old military grounds now sit at the heart of a revitalized area of the city. 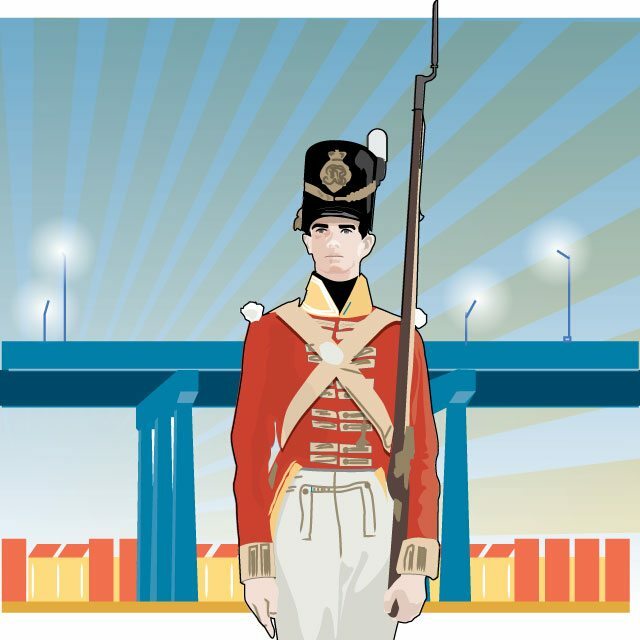 The big news from Fort York itself was the opening of its new visitor centre in September. Though still incomplete, the structure offers a visually stunning space for exhibits and other educational activities. The result of a partnership between Vancouver’s Patkau Architects and Toronto’s Kearns Mancini Architects, it has been described by the Globe and Mail as “part building, part landscape” due to its string of steel rectangular panels. This year’s edition of Nuit Blanche took advantage of the space within the fort’s grounds (even if the entrances did create bottlenecks), as well as nearby parks such as Canoe Landing. These green spaces offer a place of respite for visitors and incoming residents amid the condo towers rising nearby—and more are in the works, including Mouth of the Creek Park. The chain of parks creates public space and pedestrian corridors, even if the Ford administration did manage to stymie progress through actions such as delaying the construction of a bridge to Garrison Common. To serve the community’s creative, intellectual, and social needs, the Toronto Public Library opened a two-storey branch across from the fort in May. The branch offers amenities such as a digital innovation hub (complete with 3D printing) and architectural features such as wooden ceiling beams that honour the area’s historic wharves—and it has filled the large library desert that was created by the closure of the Urban Affairs Library in 2011. While the neighbourhood emerging around Fort York will experience growing pains, it seems poised to integrate itself at last into the fabric of the city.